I purchased this for my daughter and it is absolutely beautiful. Even better in person, very happy with the quality and the look. Just the right size for everyday wear! Combine a classic and modern look with this simply elegant sapphire tennis bracelet from the Miadora Collection. This beautiful sterling silver bracelet is secured with a box-with-tongue clasp and has a high-polish finish placing superb emphasis on its gorgeous created blue and white sapphire stones. With exquisite luster and bold color, this stunning bracelet makes a perfect September Birthstone Gift either for yourself or someone special in your life. All carat weights and measurements are approximate and may vary slightly from the listed dimensions. Treatment code CR (created sapphire). See Treatment Guide for further information. The bracelet arrived and my wife loved it. When I assisted my wife to put the bracelet on the clasp appeared to be very loose and the post on the safety clasp appeared to be missing the ball at the end so it did not appear to stay in place. Well my wife wore the bracelet and it fell off her wrist because the clasp and safety device opened. If it was not for a lady in ***telling her that the bracelet had fallen of she would not have known. I went online to chat with Hill in overstock.com I told them what was wrong with the bracelet and was planning on getting it repaired and keeping it. That was until this person named Hill asked me to explain again what was wrong with the bracelet. While I was typing the explanation again Hill actually disconnected the chat. I guess it was time for Hill to go on a break or he/she could not be bothered. This is not the first time this has happened with overstock. Well I called customer service and talked to a Very nice and helpful young lady named ***. I explained the situation to Traci and she asked me what I would like to do with the bracelet. We decided to return it for a refund. Traci took care of it for me and she was great unlike her counterpart Hill. Thank you Traci G.
Dazzling blue and white bangle. 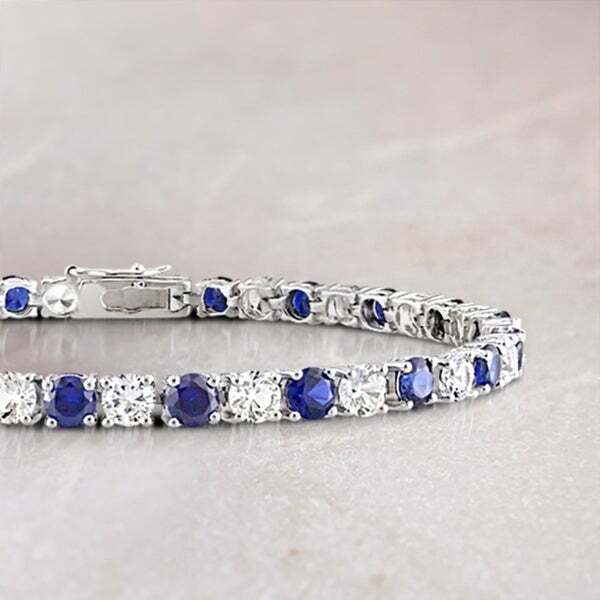 The white sapphires match each other as do the blue sapphires, creating a flawless bracelet that looks very expensive. Created sapphires are wonderful, providing perfectly matched stones that are the perfect colour without the huge expense of mined stones - which usually have to be modified! You cannot go wrong with this bracelet. I bought both the Ruby White Sapphire and Blue and White Sapphire bracelets (separate purchases). Love them both. Sometimes wear them both together. A very snazzy bracelet! Bought together with the Miadora blue and white sapphire ring, and they make a dynamic duo. Stones are the perfect size and have a beautiful sparkle. This is a gorgeous bracelet. The stones are large and the diamonds are clear and bright. The sapphires are a little darker in person than they are in the photos....but you would never guess the price of this bracelet when you see it. It looks much more expensive than it is. Excellent. My wife loved it. Very beautiful and looks like I spent hundreds more. This is a gorgeous bracelet! The blue is a little darker than I was hoping for, but they shine blue in the light. 4mm is pretty substantial, it's going to be noticed on your arm! It's beautiful! Perfect blue color! This bracket is simply gorgeous! I had been eying it for quite a while. I decided to give myself an early birthday present! It’s even prettier in person. If this is a gift, it comes in a gorgeous box! The only issue I have is the safety clasp will not close. So I need to exchange it. Happy to report, I returned the one for free and received a replacement. Perfect! Clasp works great! I’m gonna wear it tomorrow!! This bracelet was very nice, my wife loved it and it matched perfectly with her sapphire and diamond anniversary band. I purchased this bracelet as a gift for my sister. The bracelet is very beautiful and she loved it. It was a great find at the price. I’m planning to order myself one as well. For the price and what it was paired to go with for a Christmas present. It matched together perfectly. Looks great. Will make a good gift. This bracelet appears to be very well made. The stones and the silver are very shinny and foes not look cheap at all. I purchased to wear to a wedding in the spring. For the price this bracelet is a great deal. It looks way more expensive than it actually is. The recipient loved it as their Christmas gift. "Hello, is this item resizable at a jeweler? 7.5 inches is far too big, but I love the piece and would like to order it if someone can confirm that a portion could be removed by a jeweler. Thanks!" This product should be able to be sized, however once a jeweler modifies it in any way, the manufacturer’s warranty will no longer apply. "Is this tennis bracelet returnable?" Items must be returned in new or unused condition and contain all original materials included with the shipment. For more information on our return policy, please click on the shipping and returns tab and select more details.